After a few days' rest at home, it was time to hit the road again, this time for a loop around the Northeast. I would be completing US 1 from New York to the Canadian border; crossing northern New England on the eastern part of US 2; looping southwest along US 11 from upstate New York to Virginia; and finally completing US 60 from western Virginia to Virginia Beach. First stop: the Barnum Museum in Bridgeport. The museum had been closed for several years while undergoing renovations, which became plain as soon as I entered: the late-19th century building had been virtually gutted, replaced by a more modern interior except for the old staircase. The first floor focuses on Barnum's extraordinary life (even while operating his shows and circuses, he was elected Mayor of Bridgeport and served on its behalf in the state legislature); the second on Bridgeport itself (a city whose past is definitely greater than its present or likely future); and the third on some of Barnum's greatest creations, including his promotion of Tom Thumb, Jenny Lind and the circus. When I emerged, the police had blocked off the street in front of the museum -- a noisy group of several hundred demonstrators was gathered in front of the bank down the block, protesting something or other (someone said welfare cuts, another said the Rodney King verdict). I ducked down a side street, then resumed the trek northward. An hour and a half later, I reached Mystic Seaport, America's largest and finest maritime history museum. Mystic re-creates a 19th-century New England fishing town. While it has the usual array of historic theme buildings -- several dozen of them, including sailmaking facilities and an oyster-sorting shop, as well as a church, school and bank - the crown jewels of its collection are three preserved seagoing vessels. 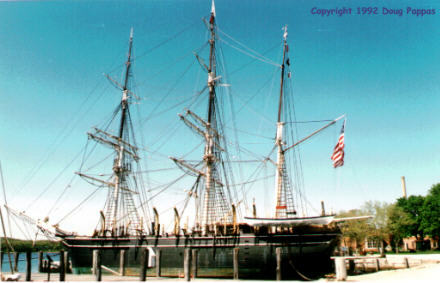 First among these is the Charles W. Morgan (1841), last survivor of America's 19th-century whaling fleet. The L.A. Dunton (1921), a Gloucester fishing schooner, and the training ship Joseph Conrad (1882) are docked nearby. Visitors are free to walk, climb and otherwise investigate each of them. 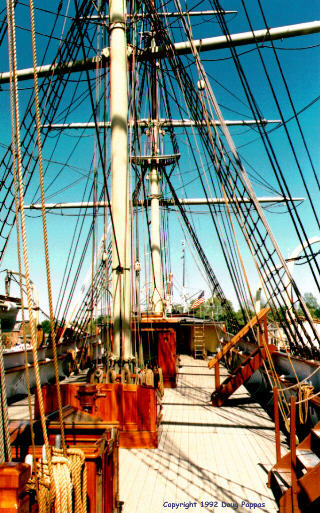 Mystic also features other nautical collections ship models, scrimshaw, decorative figureheads, a Preservation Shipyard where visitors can watch ongoing restorations, and of course gift shops.